Art.com hosted an event by Fashion and Celebrity photographer, Nigel Barker and sponsored by BOMBAY SAPPHIRE gin at its new pop-up shop location in downtown San Francisco, near Union Square. 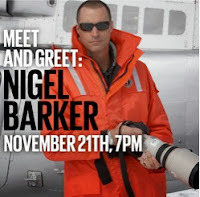 Nigel Barker shared the inspiration behind his Art.com photography collection during this intimate meet-and-greet, which included cocktails (see below for recipes). Nigel Barker has been a creative force in the worlds of fashion, beauty and entertainment for the past 20 years. He is internationally renowned for his photography, and his career has been punctuated by an array of fascinating projects. Nigel's work has included commercials, spokesperson roles, books, photograph exhibitions, international editorial assignments and the creation of his own show, The Shot on VH1. After 17 seasons as a judge on the hit show, America's Next Top Model, Barker is now the host of the Oxygen Network's The Face, alongside Naomi Campbell, Karolina Kurkova and Coco Rocha. Build all with cubed ice in large, Spanish-style wine glass. Squeeze one lime slice and add garnishes as desired. *This preparation prevents the tonic from overpowering the natural botanicals, bringing the flavors of BOMBAY SAPPHIRE East to the forefront. When using this method, one can choose to highlight any of the 12 botanicals already found in the gin. This lovely photo by TasteTV of "DiVine the Living Vine" (actually a ballet dance on stilts) was taken at a luncheon to celebrate the Winter in Venice culinary festival taking place in Las Vegas at the Venetian and Palazzo resorts. The Venetian and The Palazzo® Las Vegas are home to Winter in Venice™, the third-annual celebration of the winter holiday season on the Las Vegas Strip, called “A Gift of the Venetian.” With 49 days of seasonal experiences throughout both resorts, Winter in Venice is the ultimate destination for a holiday getaway, running Nov. 18 through Jan. 5, 2014. Intro for "TASTEABLE: California" Episode 14. On this episode, the host of TASTEABLE: California takes viewers on a weekly tour of California food and wine creators and destinations. This episode includes recipe for oven roasted squid at Jackson's Bar and Oven in Santa Rosa, cocktails at Bluestem Brasserie in San Francisco, a tour of JDV's Citizen Hotel and Grange Restaurant in Sacramento, ChocolatRouge chocolate red wine, a taste of rose wine from Bluxome Street Winery, and a recipe for goat cheese stuffed pancetta wrapped dates at Bluestem Brasserie in San Francisco.